Animal shelters are full of wonderful dogs with engaging personalities and fun-loving natures that can make a wonderful companion for anyone. However, these animals sometimes require a bit of extra commitment to overcome habits and problems from the past. These issues can be managed successfully if you are willing to devote the time and patience needed to help them over the “bumps” in the adjustment process. Your shelter dog will probably already have a number of immunizations, but you should have a veterinarian look him over to ensure that no health problems will get in the way of his re-adjustment and training. 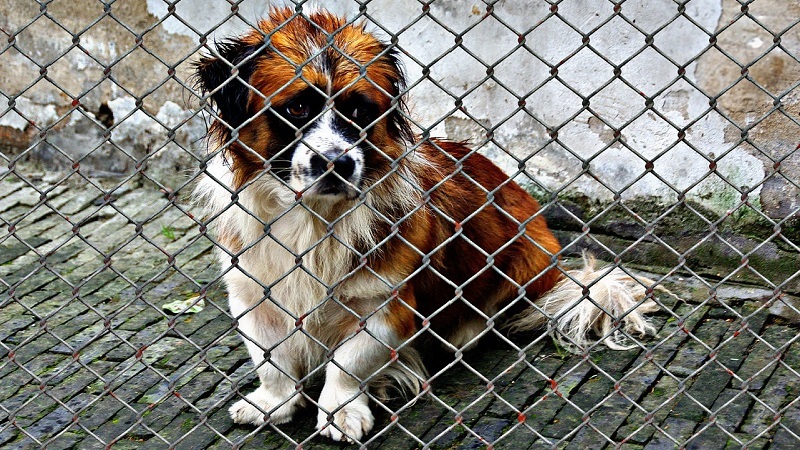 Many dogs in shelters have been the victims of neglect. A dog that is in pain or in discomfort cannot participate fully in the training and adjustment process. Your vet can prescribe treatment to restore your dog to optimum health. Many shelter animals have been rescued from difficult circumstances in which they were not given proper nutrition, often from an early age. These animals may have deficits in physical and mental ability and must be given additional time and training to achieve proper behavior. Ensure that your rescue is getting high-quality food that suits their nutritional needs to help overcome these deficits. Good nutrition will also help to overcome food-stealing, garbage-eating and other food-related problems from the past. Your veterinarian can offer advice on the best food for your individual dog. You cannot get a dog from a shelter and just put it on a shelf in your home. A dog is a living creature that has a personality, needs, preferences and expressions that are unique. Provide an environment that gives the animal sensory stimulating that makes him see, feel and think. Chew toys, puzzle toys and tugging toys help provide physical activity and an emotional outlet. Toys also provide opportunities to interact with you, for fun, exercise and bonding. A simple box with holes cut in the top can provide an interactive experience that makes your dog problem solve. Invite your new dog to share politely in the comings and goings of people in the household. Interaction with other animals, whether while walking around the block or at your local dog park can provide the socialization every dog needs. With any new dog in the house, owners experience moments of doubt over whether the animal is right for them or whether they are equipped to train the dog appropriately. These moments can occur after a dog owner thinks they have done everything the books and Internet sites recommend, which haven’t worked as well as they had hoped. If your dog is having difficulty with housebreaking or other aspects of training, double down on the patience and commitment to achieving your goal. Stay calm and confident. Project a feeling of friendliness and positivity. Your dog will pick up on these emotions. And he or she will try to live up to your expectations. The single most effective way to acclimatize a shelter dog to your individual living situation is to spend time with him in your home and take him with your on your errands. Dogs pick up on the rhythms, sounds, movements and activities that go on around them. When your dog has fully integrated your lifestyle, he or she will become relaxed and accepting of the new environment. Talk to the animal frequently throughout the day. You don’t have to come up with deep, highbrow subjects. Simply talk about what you’re doing, what he is doing, what’s going on around you both and what you’ll do next. This stream of communication tells the animal he is an important part of your home environment and your lifestyle. The dog will match your conversation to your actions on an instinctive level, so play fairly with him. If you promise an outing, make sure you provide a stimulating outdoor experience. If dinner is imminent, make sure it’s there on time. The animal’s trust in you will increase with every interaction, and you will become better acquainted with his reactions and responses. Correction is made easier in this way, and mutual understanding deepens quickly. Adopting a shelter dog is a great thing to do and the dogs found at your local animal shelter have usually been thoroughly screened to ensure that they can become good companion animals. However, to get the best from your rescue, and to achieve the highest level of connection, you will have to invest the time and trouble to get to know his or her needs, and allow the animal to get to know yours, in order to build a bond of trust and mutual respect.